In my 55 years of life, I had never until yesterday seen a flag which was a saltire on one side and a union jack on the other. Yet last night thousands of them were distributed free at the Commonwealth Games opening ceremony. I have been told they are being given out at the swimming today, and possibly at other venues too. Such flags do not normally exist. They had to be specially commissioned, and somebody had to pay for them. Who paid for them? Is it public money? There is no doubt why these unique flags were commissioned, and why they are being given out free at considerable expense. It is to provide TV images of Scotland combined in the union, and to make sure that Scottish medals are greeted with media images of union jacks being waved with the saltire. In the context of the referendum, only a hardened liar could claim that these unique flags were commissioned without a view to the campaign. This is enormous hypocrisy by the unionists, who have been bombarding the media for weeks with warnings to Yes supporters not to “politicise” the Commonwealth Games. Well hold on, some flags will not be allowed to fly. Political flags. Both sides of the independence debate have agreed not to use Glasgow 2014 for political gain anyway. But even if you wanted to, well, it’s against the rules. Glasgow 2014 Venue Regulation 6.18 states that no flags are allowed to enter a venue – or the vicinity of any Games venue – if they are normally associated with causes, affiliations or organisations. Nobody can possibly argue that, at this time, a Union Jack combined with a Saltire is not an image strongly associated with a cause or association. So the rules are being quite deliberately broken, and somebody is funding that breach and doing it on a massive scale. It is vital that we know: who is paying for these flags? The United Kingdom is not competing in the Games. So there is a very respectable argument that union jacks should not be allowed in at all. What is absolutely certain is that the two-faced union jack and saltire flags are very strongly associated with a political cause or affiliation. If they are allowed in, then Yes saltires should be allowed in too. 78 people died at Glencoe and we still sing about it over three hundred years later. Over 700 have been massacred so far in Gaza, 80% of them innocent civilians. The UN Human Rights Commissioner has made the very obvious, the unarguable, point that there is prima facie evidence of war crimes by Israel. 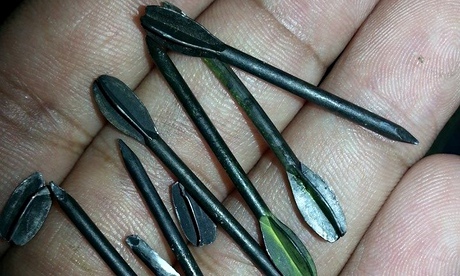 These include the killing of four young boys playing football on the beach at Gaza, and the use of industrial nail bombs in civilian areas. Yet the UK refused to support even having an investigation. 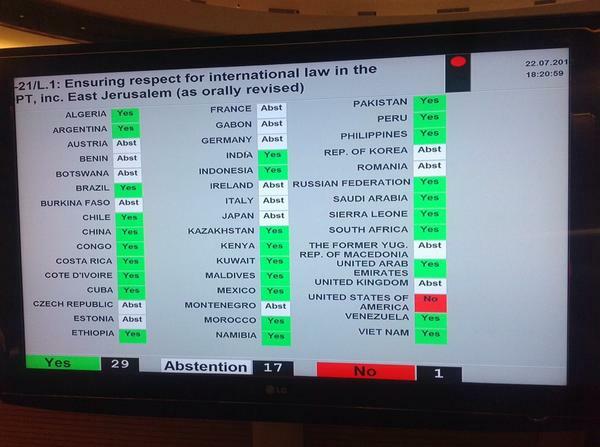 Please note this was not a vote to condemn Israel, or to declare war crimes. It was a vote to have an investigation. I am ashamed to belong to the UK. Just as having served the UK for twenty years and having worked my way up to be a proud British Ambassador, I became so ashamed at our complicity in torture and extraordinary rendition, I had to resign. Now imagine that board with Scotland on it and a green light next to it. 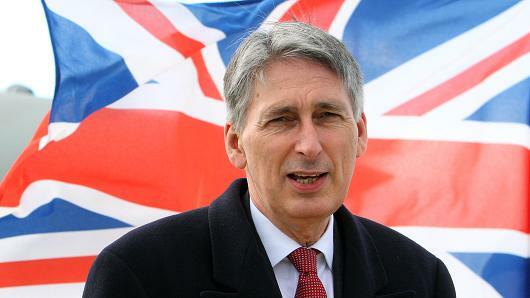 This is the British Foreign Secretary. He declares that Israel “has a right to defend itself” and that for the UN to investigate Israeli war crimes is “unhelpful”. This man does not represent me, or anything about me. Nor, emphatically, does that flag behind him. 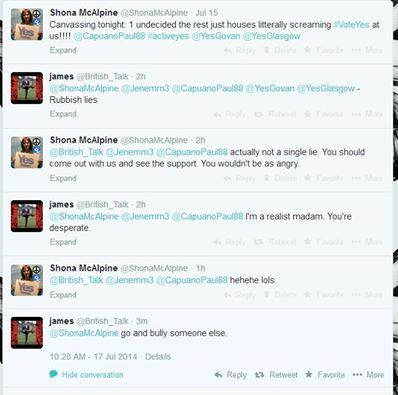 Evil Cybernat Bully Shona McAlpine has been stalking and harrying a poor innocent unionist. Doubtless this will be in the Daily Mail tomorrow. I am fascinated by how the BBC are going to play the Commonwealth Games opening. There have been numerous warnings to Alex Salmond not to try to stoke up a wave of patriotism on the back of the Commonwealth Games, just as of course there was absolutely no effort to stir British patriotism around the London Olympics. There was absolutely no waving of union jacks, no jubilant celebration of home victories, no commentators getting all emotional at award ceremonies at the London Olympics, was there? So I have no doubt the Commonwealth Games will be treated by the BBC, just as the launch of that useless expensive aircraft carrier was, as a unionfest. Any boos aimed at Alex Salmond will be gloatingly reported and tweeted, while the boos for Charles and Camilla will be turned off the soundtrack and ignored. George Osborne has already used the Commonwealth Games as a platform for anti-independence remarks, and Cameron is coming to Glasgow and will do the same, but woe-betide anyone who besmirches the political neutrality of the event with a pro-independence comment. I have already seen a girl who plays badminton and a cyclist interviewed on the BBC to say they could not train or be financially supported in an independent Scotland. That some of the money that we send down to England actually comes back again seems to some cringing Scots like a reason for eternal grovelling gratitude. Training for elite sport is worldwide now, and doubtless some will still be done in England, also in the rest of Europe and in the States, for Scots sportsmen and women after independence. Interestingly I have seen no attempt by the BBC to interview any pro-independence Scottish competitors. I replied that any criminal attack on a person was in effect an intrusion on their human rights. That in my view “terrorism” consisted of activities which had always been illegal, such as murder or conspiracy to murder, and that the “anti-terrorism” industry was already massive without Human Rights Watch joining in. I felt that HRW could best operate by continuing to expose abuse of power by authorities. Anyway, HRW have now produced a useful paper cataloguing the fact that all recent “terrorist plots” in the United States have been agent provocateur operations initiated by the massive anti-terror industry to keep itself in business. Some convicted terrorists were even ideologically opposed to terrorism before being brainwashed into it by FBI agents. This is all important and true, but the problem is that most of us have known this for years. HRW also steer clear of some of the glaring inconsistencies in the Tsarnaev narrative. has noticed the fact that Jean-Claude Juncker supports Scotland’s membership of the EU. The interesting thing is that the journalist, Andrew Whitaker, has apparently spoken to the same source that I spoke to two weeks ago, and got almost precisely the same answers. The fact is that the source I spoke to (apologies convention is they can’t be named) was absolutely the obvious place to go. Plainly James Cook of the BBC and now Andrew Whitaker eventually got there, but only after the entire media in Scotland had run with the opposite and entirely untrue story. But it was not at all difficult to discover the truth. It took me twenty minutes, ten days before any journalist even thought of it. Now we finally have some belated journalism happening by people who, unlike me, are actually paid to do it. The divorce of the political class from the people – commonly referred to in the media as the decline of trust, as though it were the people’s fault – has been a huge phenomenon of recent times. 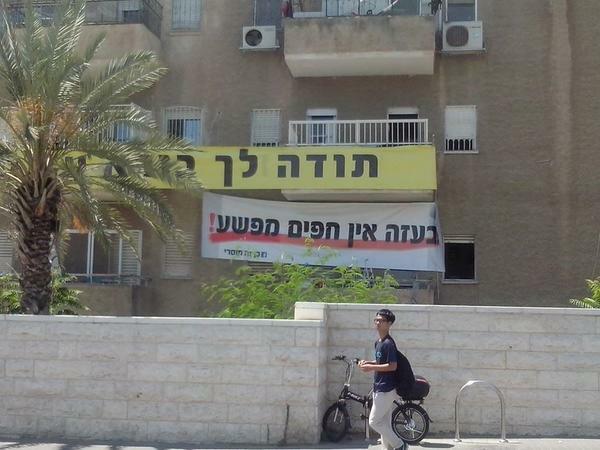 In the case of the vocal and unreserved support of the political class for Zionism, it really does seem to be as simple as the constant pumping of pro-Zionist money to the politicians. Actually, this makes it a useful marker for how the entire rotten system works. Unionists were in frenzies of delight this past 24 hours at Juncker’s statement that he saw no further enlargement of the EU for five years. Wings Over Scotland has done an excellent job of summing up the triumphalism of the media and of every senior Unionist politician you can think of. The BBC deserves the massive criticism it has been given for unionist bias, but James Cook of the BBC deserves credit for asking Juncker’s office whether his statement included Scotland. The reply could not have been more clear. Juncker did not include Scotland in that statement. As Juncker had said before, Scottish independence is a matter for democratic decision and is an internal EU matter. Juncker was talking abut the length of time it would take applicant nations to meet the acquis communitaire, or body of EU law, regulation and obligation. Scotland, by definition, already does meet the acquis. All this Juncker’s office told the BBC explicitly. What is implicit, and self-evidently true, is that Scotland’s independence is not an enlargement, it is just Scotland remaining in, requiring some internal readjustment. This ought to be good news for everyone – including the unionists. I can understand that there are people who genuinely love Scotland, but wish for reasons of history to retain the United Kingdom. I even understand some of those honestly believe Scots will be wealthier and happier in the UK. I think they are very wrong, but entitled to that view and some people hold it sincerely. But such genuine Unionists, should they lose the referendum, would surely wish Scotland to remain in the European Union? That already guarantees the continuance of all the most essential links between England and Scotland, in particular full freedom of movement and settlement and trade and citizens’ rights. It is also important for Scotland’s future prosperity. Surely a real unionist would want to retain the Union, but still want Scotland to remain in the EU if it became independent? But instead, every professional unionist politician was gloating at the entirely fictitious prospect of Scotland being kicked out of the EU. They were absolutely delighted at the prospect. They really hate Scotland. There are decent unionists. But the professional politicians are not decent unionists. They were delighted at the very idea that Scotland might be kicked out of the EU. Because actually they hate, despise and fear Scotland and the Scots. For them, Scotland only exists to pay for their very comfortable public funded lifestyles. The idea they may lose their power, influence and above all their money, horrifies them. I have a prize of two hundred pounds available to the first person who can show me an instance of the media reporting Juncker’s clarification with the same prominence, space and energy they devoted to splashing the Unionist scare story.